Or, strictly speaking, as this is a Halloween themed post, broomsticks*. There is, officially, a shortage of pumpkins. This 'crisis' has led to calls that the large rounded, orange squash-plant (pumpkin definitely has a better ring to it) should be replaced by the turnip. I'm not convinced. Not only because a turnip is reportedly harder to carve, but its rather like replacing Nigella in her latest TV series with the part-time chef from your local; disappointing, cheerless and a lot less glamourous. 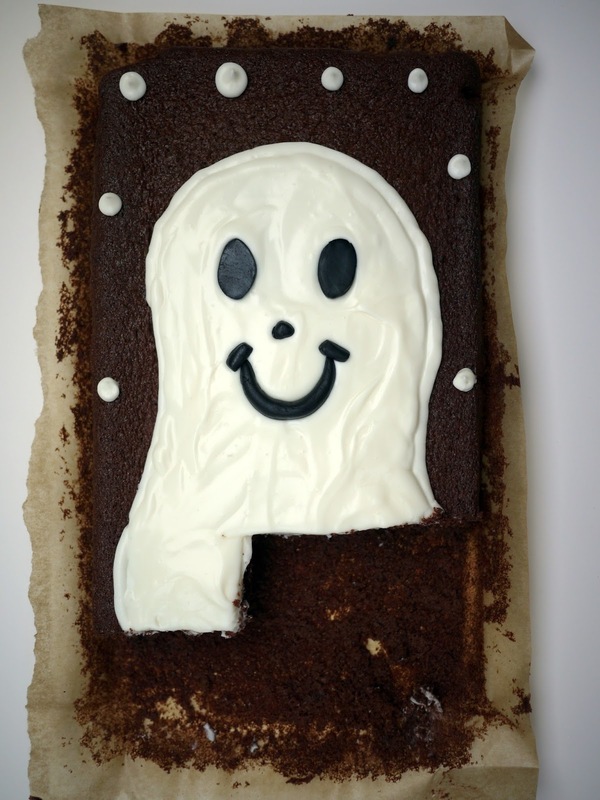 But for all those of you dishearteningly chipping away at your turnip Jack o' Lantern this Halloween, comfort yourself by baking this super-easy, family-friendly (well, the ghost is a happy 'un) chocolate traybake. * doesn't quite have the same impact, admittedly. Pour into the tin, spread evenly and bake in the preheated oven for about 30-35 minutes, or until well risen, firm to the touch and the cake is shrinking away from the sides of the tin. Leave to cool in the tin for 10 minutes, then turn out onto a wire rack. 5. Beat together the sifted icing sugar and cream cheese until smooth. 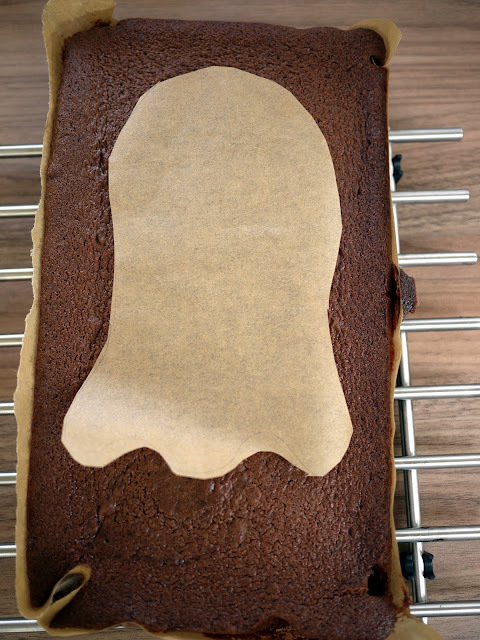 Pipe the icing around the ghostly template and spoon the remainder of the icing inside the piping, smoothing over. 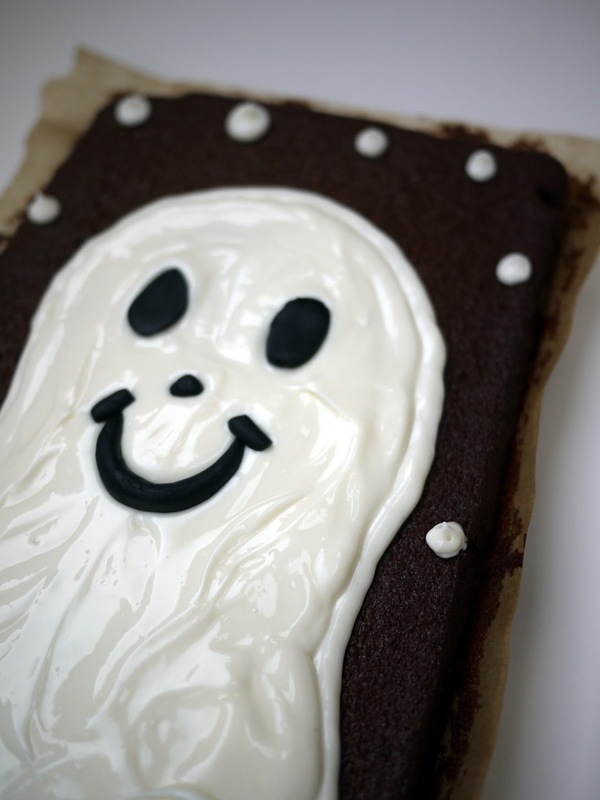 Decorate with the fondant icing shaped into your ghost's eyes, nose and happy smile! It was years ago now, but I have actually seen a carved Halloween turnip. I don't think there was a shortage back then though, just somebody using what they had at the time! 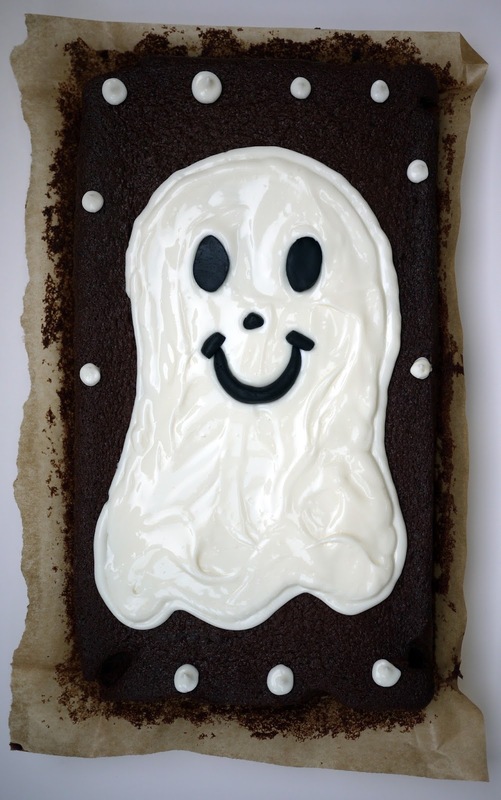 I love your cute ghostie decoration - you've made me want to bake something Halloweeny. I love this cake, the ghost is actually quite cute! I'm not sure about the pumpkin shortage as there's loads of them in my local Tesco! Same here, our local Tesco had mountains of them.......perhaps that 's why there's a shortage in the rest of the country. The cake looks wonderful, great fun and delicious.